*Disclosure: I received educational kits from Pitsco Education at no cost in exchange for a review. As always, all thoughts and opinions are my own. I only review products that I would use with my own family and those that I believe other families will enjoy. Pitsco Education was founded by three teachers over forty years ago. The company is committed to helping teachers and students succeed in the areas of science, technology, engineering, and math (STEM) through innovative educational solutions. Pitsco Education offers resources that are perfect for classrooms, co-ops, afterschool programs, and the homeschool setting. I’ve had my eyes on Pitsco for a couple years now and I was thrilled to be offered the opportunity to try some products with my STEM-loving crew. What did the kids think about these hands-on STEM kits from Pitsco? They loved these kits! Six little Curley thumbs up! Of course, I wasn’t surprised. I had a feeling these kits would be fantastic and Pitsco did not disappoint. Almost everything is included in each kit so you can pick up and go. The only things we needed were common household items (examples: sharpie, glue, scissors, Phillips head screwdriver). The instructions are detailed and easy-to-follow, with both written instructions and plenty of fantastic visuals. There are tons of teacher tips included, with ideas for lessons, extension activities, and further study. We received our Pitsco STEM kits a couple of weeks before Christmas. Energy was high and motivation was low. Trying to wrangle the kids to do anything was a challenge… with the exception of these kits. We had a week of nothing but STEM thanks to Pitsco and we had an absolute blast! The Balloon Car Explore-A-Pak is suitable for multiple students and recommended for grade 3 and up. The kit contains balloons, wheels and axles, templates, instructions, and other necessary materials for 50 students. It would be perfect for a homeschool co-op, classroom, afterschool program, or a birthday party! My kids LOVED this set. We colored an entire fleet of balloon cars and raced them, noting which cars were faster than others and why. Over the course of the week, our designs became wilder. We named our cars and they took on a life of their own. We had friends over to make more cars- the more the merrier! To learn more about this amazing STEM activity and to see a more professional video than the one above (I know I should have held my phone horizontally- a videographer, I am not), click here. Teacher lessons are also included. As we completed these challenges, I kept wishing that I had these challenges last year and the year before while leading a Destination Imagination team. These STEM challenges are simple to set up but they offer a wealth of hands-on learning opportunities! Recommended for ages 12 and up, this Sled Pull Challenge kit is so much fun! My children loved building the battery-operated tractor and then experimenting with various gear ratios and resulting performance. We had such a blast with this kit and its speed that we actually broke a wheel during a collision. This led to even more learning as my kids had to tweak the design! This little tractor is still going strong, well over a month later. It’s a favorite toy in our home at the moment! Click here to watch TAG members discuss this challenge. The Nanotechnology Floating Magnet set is recommended for ages 12 and up. I used this set with my oldest son who absolutely loved learning about the behavior of molecules and the concept of magnetism. The kit uses foam shapes and powerful magnets to visually represent how different molecules behave. We had fantastic discussions and dove down a few rabbit holes with this one! Do you have a little scientist who loves STEM? 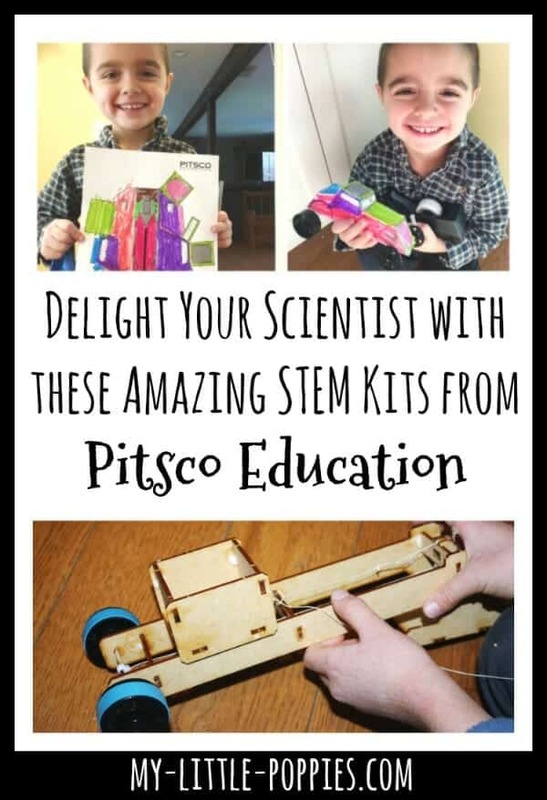 Our family enjoyed every second of our time with Pitsco Education’s stem kits and we plan to use them again in the future, and to explore other kits and resources from the site. Now, it’s your turn. Tell me, do you have a STEM kit that you love? Share here!